Design Republic designed the expansion of Yelp’s offices located in New York City, New York. 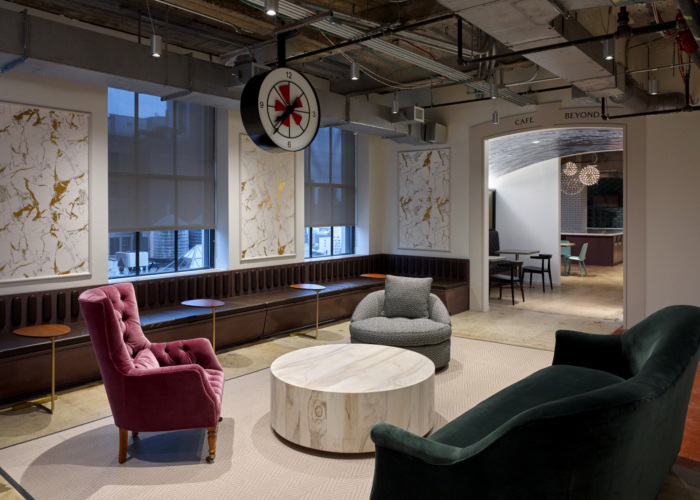 After recently completing Yelp’s New York office project, Design Republic was pleased to be called upon again to facilitate an expansion project occupying the 17th floor of Yelp’s quickly growing NYC presence. The concept of celebrating local neighborhoods developed as part of the design for the 160,000 sq ft original project was maintained as a key design component for the expanded space. Design Republic’s design team created distinct neighborhood inspired designs, with two neighborhoods selected for the expansion project determined by a Yelp employee vote: Soho and Hell’s Kitchen. The café and lounge common space was inspired by Grand Central Station. The decision to place Grand Central directly off the entry enabled the space to be a natural crossroad for those on this floor and colleagues coming from the lower stack. Curved archways with custom wallpaper reminiscent of the iconic celestial mural found in Grand Central flanks the lounge space. Antique glass, large twinkling decorative lights, and a subdued palette harken back to the Station’s inspirational atmosphere while still presenting itself as undoubtedly Yelp reinforced by a custom ceiling mounted iconic Yelp branded clock to welcome employees and guests.